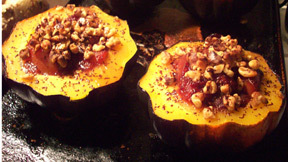 Acorn squash stuffed with a reduction of figs and nectarines. A true celebration of autumn! 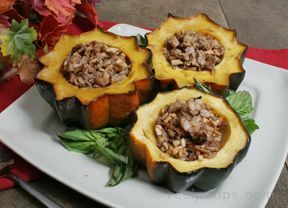 Begin by flattening the ends, halving the acorn squash, and removing the seeds. (Save the seeds for roasting! They are more delicious than pumpkin seeds!) Pour about one tablespoon of water onto a sheet pan and place squash upside down on pan. Roast for 30-45 minutes or until squash is soft. Meanwhile, in a medium pot, combine 1 blood orange (slightly mashed), quartered figs (remove stems), cubed nectarines, juice from one lemon, wine, water, sugar and corn syrup. Let mixture reduce over medium heat for 30-40 minutes or until it has reached a preserve-like consistency. Rest compote off heat until ready to use. Lightly toast walnuts in a small pan, no lubrication necessary. Let squash stand until cool enough to turn over. 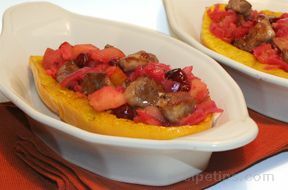 Spoon compote into squash cavity. Top with toasted walnut and place back into 350 F oven for an additional 15 minutes. Finely grate chocolate over the top. Serve warm.